A country that is in great need of more gospel workers is Sudan. There are increasing opportunities for gaining access to Sudan, though the country remains unstable and local Christians face strong persecution. However, of the 143 people groups there, 129 remain unreached with the gospel. The Sudanese people need to hear the gospel, they need more labourers and the country needs our prayers. May God mightily bless and encourage you as you pray and intercede for this nation. “When we returned there was nothing. Everything had been bombed.” CMS local partner Bishop Hassan Osman James, assistant bishop in Kadugli, Sudan, returned to the Nuba Mountains three years ago. Since then he has worked with other local leaders to set up training, provide a feeding programme and offer literacy classes. Pray for those living in the Nuba Mountains: that as their needs are met by the church, they would know that they are not forgotten. Pray also that there would be good community relationships between Christian and Muslim groups to help the church communicate the good news of Christ, and for Christians to be able to model reconciliation in a context of division. A lady from a middle-class family in Khartoum was diagnosed with and treated for leprosy at Aburoff Clinic in Sudan. Through staff encouragement she won her own battle of self-stigma and brought her husband and children alongside her, but she was afraid that it would change how other people behaved towards her. Now, her courage and determination enables her to advocate for people with leprosy. She discreetly educates other people in the community about leprosy. Give thanks for people like this lady who have the courage to stand up for those with leprosy. Pray that her example will encourage others to do the same and give thanks for the excellent care that the Aburoff Clinic provides. The Aburoff Clinic is the only specialist leprosy centre in Sudan. It provides eye care, wound care, reaction management and provision of protective footwear. The staff at TLM Sudan manage the clinic, work with ophthalmologists in Khartoum and cover all aspects of The Leprosy Mission’s work in Sudan. Pray that God will strengthen and guide them on how to best serve people affected by leprosy. Pray that widespread fear and stigma towards leprosy-affected people in Sudan would be eradicated so that people with leprosy and other disabilities are not marginalised, rejected and isolated but find healing and hope in Jesus. The trial of a Czech aid worker and two pastors has ended, with the judge sentencing the Czech to life in prison, for espionage and “spreading false news about the country”. He has also been fined 100,000 Sudanese pounds (about £12,400). His crime was that he had video and written material about the persecution of Christians and the bombardment of civilians in the Nuba Mountains. The Czech foreign ministry has rejected the ruling and is sending a minister to negotiate his release The other two defendants, Sudanese nationals, were each sentenced to 12 years prison for “rendering criminal assistance”. Pray for all three, and for their families, in their distress. The cities of Khartoum and Omdurman have been the scene of a series of arrests of clergymen and church members. It’s part of a government policy of repression characterised by harassment, intimidation, imprisonment and seizure or destruction of places of worship. Join us in praying that God would touch the hearts of the Sudanese government and bring about a powerful change in the country. Tearfund offices across Sudan were informed by government officials that their work was to be closed down by the government last year. 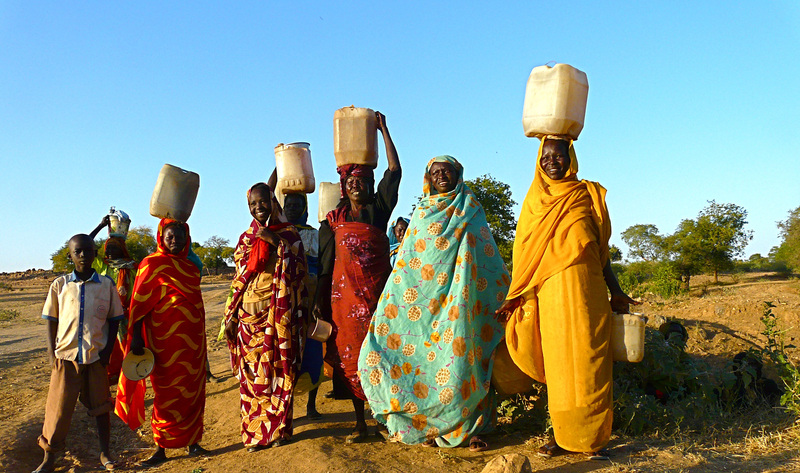 Tearfund has worked in Darfur since 2004 providing 300,000 people each year with life-saving humanitarian support. They provide care to 30,000 acutely malnourished children and nursing mothers per year. There are urgent discussions taking place with government officials, donors, other NGOs and the UN to ensure the critical needs of these vulnerable people continue to be met. Pray for God’s hand upon these discussions, and that He will continue to minister to those in need. Like so many other Sudanese people groups, the Gaaliin follow the Islamic faith, and are generally very committed Sunni Muslims. Only a small percentage of the Gaaliin have been exposed to the gospel in a positive way. This has mainly been accomplished through penetrations by Sudanese believers into the Gaaliin areas. Churches comprised of Southern Sudanese members and evangelistic outreaches led by national Christian groups have helped reach the Gaaliin. They are a people who are critical in reaching the whole of Sudan, for they are the pulse of the cities and a key stone in breaking through the Islamic grip that holds the nation of Sudan. Ask God to strengthen, encourage and protect the small number of Sudanese Arab believers. Pray that fear of persecution from Islamic relatives will not hinder Sudanese Arabs as they consider the Gospel. The Kanuri people live in the southern province of Sudan. Many of the people work as farmers but will practice other occupations during the dry season. The Kanuri have been Muslims since the eleventh century. The Qur'an emphasizes the importance of the family and the supreme authority of the father. Women are considered inferior to men in the Islamic scriptures, and are treated as such in Kanuri society. With less than 2% Evangelicals and no active efforts in this unreached Muslim community, the needs are great. Ask God to call people who are willing to go to Africa and share the love of Jesus with the Kanuri. Ask the Holy Spirit to soften the hearts of the Kanuri towards Christians so that they will be receptive to the gospel. Ask God to raise up prayer teams who will begin breaking up the soil through intercession. The Aburoff Clinic in Khartoum is the only specialist leprosy centre in Sudan, with people affected by leprosy come from across country for treatment. Supported by The Leprosy Mission in Sudan, the centre provides support with self-care, as well as acting as a training centre for government staff. Praise God for the agreements set up and pray for good relationships to facilitate effective operation. Pray for discernment, wisdom and strength to make good decisions for the country leader and for God’s favour and protection on all of the staff as they work hard to handle the challenges and development of their work. It is two years since South Sudan voted to become independent from the north, yet tensions remain high, particularly in the border regions. Pray for the negotiations between the two states, and ask God to turn the hearts of the leaders towards reconciliation. Following the government’s crackdown on churches in December 2012, several mission agencies and churches in Khartoum have been shut down. Pray for unity, boldness and wisdom for Christian leaders, and ask God to provide for those who have lost their jobs. The Sudanese government has announced that no new licenses for building churches will be issued. The decision was justified by claiming that it was due to a lack of worshippers and a growth in the number of abandoned church buildings but added that freedom to worship is guaranteed in Sudan. However, this decision was announced against the backdrop of a campaign of repression against Christians in Sudan that began in December 2012 and has continued into 2013. Pray that the government would be true to their word and work towards freedom of religion for Sudan. Pray too for unity among Christians in Sudan. On 3rd April, reports started to emerge of violent clashes between two tribes in central Darfur. Tribal leaders claim that many people from both tribes have been killed or wounded, although exact figures are not yet known. It’s estimated that tens of thousands of people have fled their homes, many of them over the borders into Chad. Fighting between these two tribes has continued in other parts of Darfur. Please pray for those who have been affected and for agencies responding to the situation. Finally, pray for a lasting peace in Darfur. The Dar Hamid people of Sudan are a confederation of about nineteen tribes and several sub-groups (population 695,000). They are a nomadic group who share a common culture and are led by a single chief. Traditionally, the Dar Hamid are Sunni Muslims. However, as a rule, most are not religious and know very little about Islam. Very few can read or write, and the written word is actually considered a source of magical power. Pray for chiefs and key leaders to be saved and to boldly share the gospel with their own people. Pray too for teams of believers to be raised up who will live and work among the Dar Hamid. The Mararit are one of several ethnic groups collectively referred to by the term Tama. They live along the Chad/Sudan border, and their language (Mararit) is a dialect of the Tama language. The Mararit people are Muslim and, like many Muslims, they practice Sufism, a mystical form of Islam. A small minority also practice more fundamental forms of Islam, such as Wahhabism or Salafism. Ask the Lord to reveal Himself to the Mararit and pray for teams of believers to be raised up who will live and work among them. The Kimr people of Sudan (population 143,000) live along the border of Chad and Sudan. Although they adhere to Islamic teachings, they also mix animism and witchcraft with their Islamic practices. Ask the Lord to bring a team of believers to the Kimr people to share the love of Christ with them. Pray that they would be released from the spiritual powers which are keeping them bound. Pray too that key leaders, both in the Sudanese government and among the Kimr, would be come to know Jesus and would boldly share the gospel.